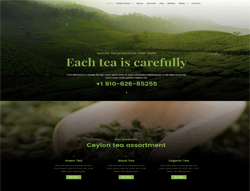 LT Tea is Responsive WordPress theme designed especially for Tea Store or Tea Business websites. Actually, use this theme to present the types of tea, its styles and classification in a very effective way. All the attractive design are specifically targeted to those who love tea in general. LT Tea comes with a responsive and mobile-friendly design that makes your website look spectacular across all screens, tablets and mobile devices. With this theme, you can expect to find lots of advanced options like strong shortcodes, highly customizable theme options, unlimited color and a color picker in the admin panel. Furthermore, we offer support services like Bootstrap CSS, Hybrid framework and drag-drop layout content ready to help clients develop their websites.